A baby with two heads has been born in Bangladesh. The child, which is actually conjoined twin sisters who share a single body, two arms and two legs, was delivered by Caesarean late last night, according to officials. Born in the Brahmanbaria district, she is now being treated for breathing difficulties at the intensive care unit of the country's largest hospital in Dhaka. Her father, Mia Jamal, said he was 'awestruck' when he saw his her. He said: 'She has two fully developed heads. She is eating with two mouths and breathing with two noses. 'Still, I thank Allah that she and the mother are now OK,' he told the news agency AFP. Tests have shown the child has only one set of vital organs, said Abu Kawsar, owner of the Standard Hospital of Total Healthcare where the baby was born. He said: 'Except for having two heads, the newborn has the rest of her organs and limbs like a normal newborn'. It may be that the child has a condition known as dicephalic parapagus - an extremely unusual form of twin conjoinment where only a single body develops. This is a rare phenomenon, occurring 1 in 50,000 to 100,000 births, according to the Journal of Family and Reproductive Health. However, 60 per cent are stillborn or die shortly after. Thousands of people thronged the hospital in Brahmanbaria, where she was delivered, some 120 kilometres (75 miles) east of Dhaka, after news spread of the 'miracle newborn'. In the past, babies born in countries such as Bangladesh and India with physical abnormalities have been viewed as living gods. 'The entire town poured into the clinic. There were thousands of people with some of them coming from the nearby villages,' Mr Kawsar said. Her father, a poorly paid farm labourer, said he was concerned about how he would manage to care for the baby if extra expenses were needed. 'I feel sad for her. She has been born to a poor man. I don't have money to even properly treat her mother,' he said. 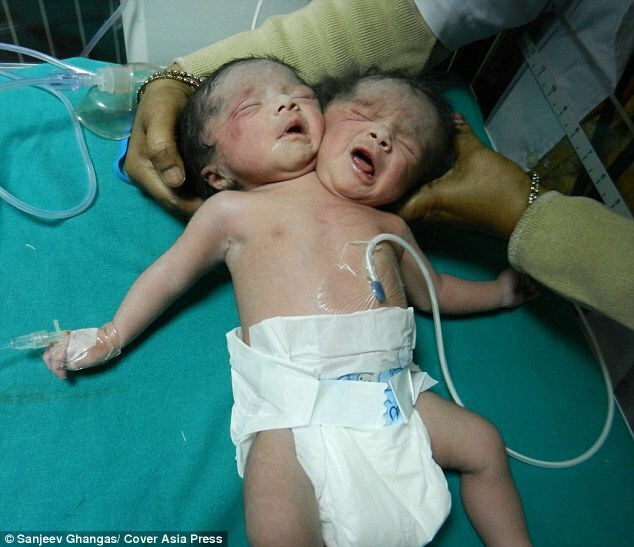 Because they share the same body and organs, it is not possible to separate dicephalic parapagus conjoined twins. The birth of this type of conjoined twins - who develop after a fertilized egg cell fails to divide fully - is extremely rare, with most cases occurring in southwest Asia and Africa. Last year, a baby with two heads was born to a mother in India, who was too poor to have an ultrasound during her pregnancy. However, the infants died after 20 days. 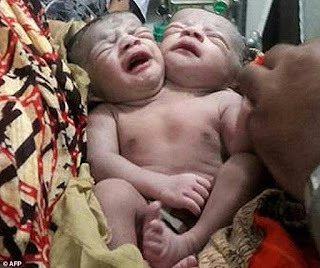 Another baby named Kiron was also born in Bangladesh with two heads in 2008, but later died. There have been instances of dicephalic parapagus twins being born in the West. In July 2009, Lisa Chamberlain, from Portsmouth, gave birth to twins Joshua and Jayden, who shared the same single body. Joshua was stillborn while his brother lived for 32 minutes before dying in his mother's arms.